I've stated this before, but I'll just start this post off by saying again that when it comes to beauty products I am such a creature of habit. When I find something that works I stick with it and don't switch until it either stops working or I get a recommendation from someone that a product is actually pretty life changing. I also don't wear a full face of makeup every day, I normally just fill in my brows and put on some mascara because when you work at a barre studio you'd look a little silly wearing much more. So, keeping that in mind, most of the beauty products I recommend are things I use daily and create a pretty natural look! Lavanila Sport Deoderant / Oh deodorants. Some people (like my husband) have been able to use the same one since they started using deodorant but unfortunately I am not one of those people. For some reason I have to end up changing mine up every few months. If I'm lucky, I'll be able to use it for more than a year, which is what happened with this one from Donna Karan. When that one finally stopped working for me, I decided to do a little research about natural deodorants that don't contain aluminum and came across this one from Lavanila. While I will probably never switch all my beauty or household products to natural/clean products, I absolutely love that it doesn't contain aluminum and it actually works. I do have to apply more than once if I'm doing an intense workout, but it has a clean scent and stands up to even the hardest SoulCycle classes! Philosophy Amazing Grace / I've used this perfume on and off since college and it is somehow the one that I always go back to when I'm in a fragrance rut. It's light, clean and is probably the only perfume I've worn that does not change scent throughout the day. I love this during the summer because I can wear it to barre or outside activities and it still smells the same as when I put it on that morning! 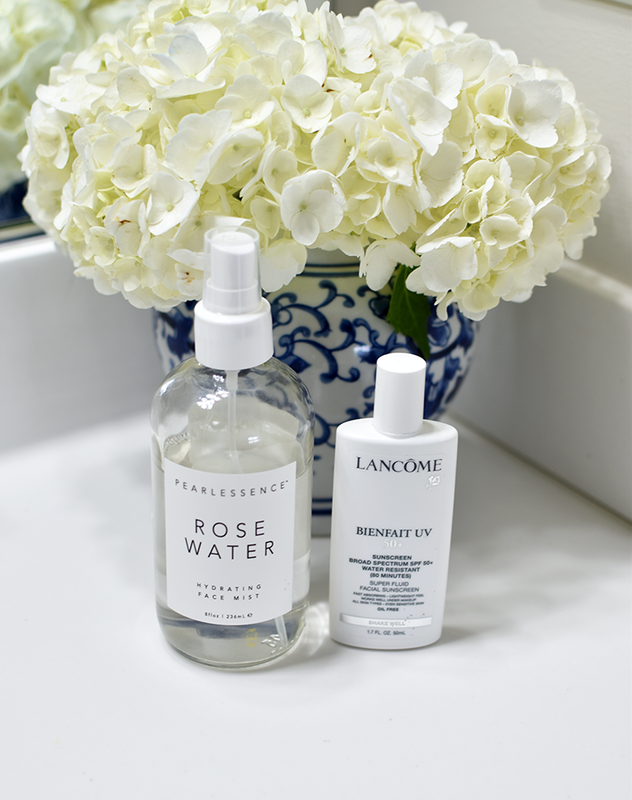 Pearlessence Rose Face Mist / I picked this up on a whim one day when I was at TJ Maxx and I cannot get enough of it! I use this after washing my face before I put on any serums or when I come in from walking Pecan and need to cool off. It's so refreshing and the scent is not an overpowering floral like most rose mists I've tried. I couldn't find the exact one online, but I see it almost every time I'm in TJ Maxx! Lancome Beinfait Sunscreen (c/o) / I've used Neutrogena sunscreen since Kyle and I started dating (I remember this specifically because before I started dating a red head I rarely wore sunscreen). I cringe thinking about that now because I'm very adamant about wearing sunscreen daily. Like I mentioned above most days I don't wear a ton of makeup so I was fine using whatever sunscreen on my face because I wouldn't be putting anything on top of it and days when I did wear foundation, I wore one that had a little SPF in it. The more research I've done however mentions that your SPF in your foundation is most likely not enough to last you throughout the day. Most traditional drugstore sunscreens are pretty heavy and I didn't like the way my foundation would wear on top of it so I was eager to try this super fluid sunscreen from Lancome. It is really lightweight, doesn't have too much of a sunscreen smell and doesn't affect the way my foundation wears throughout the day! Take it from someone who has a family history of skin cancer and has seen how awful it can be, please, please wear your sunscreen daily! Julep Facial Oil (c/o) / Face oils were never really something I had considered adding to my routine because I really didn't think my skin texture and type warranted it. 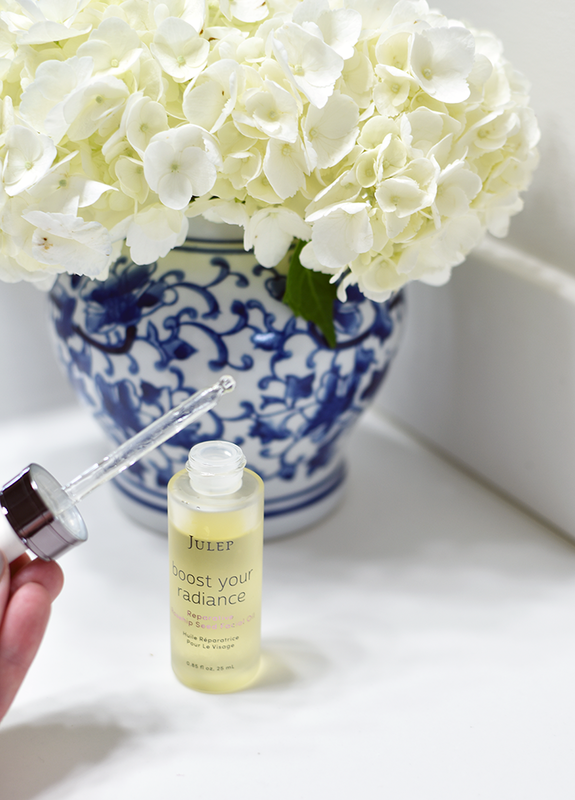 I've been using this facial oil from Julep every night for a month and I am shocked at how it makes my skin feel. My skin has more of a glow, my skin tone appears more even and even though we're in the dead of summer my skin does not feel oily! 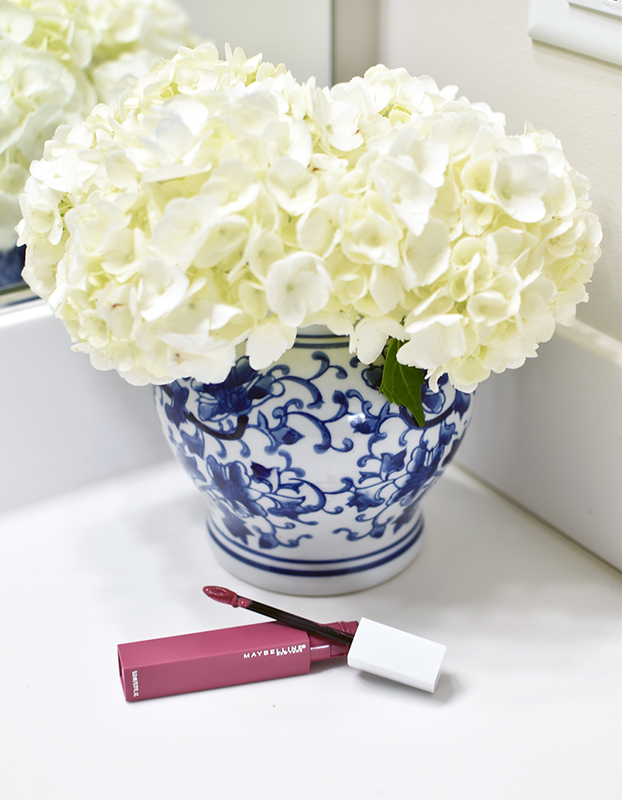 Maybelline SuperStay Matte Ink Lip Color (c/o) / I love a good matte lip but I don't love the dry, caked on feeling that comes with most long wear products. I decided to test this one out on a day we would be having lunch with friends and running errands all day and I'm really shocked at how it performed. I did feel a little different when I first put it on, but I really attribute that to the fact that I usually wear a non-longwear lip product. It lasted through lunch, drinking out of straws and water bottles all day and I still had to use my makeup eraser towel to get it off at the end of the day! Needless to say I was hooked! My favorite color so far is 'Lover' but I really want to try 'Dreamer' and 'Romantic' as well! 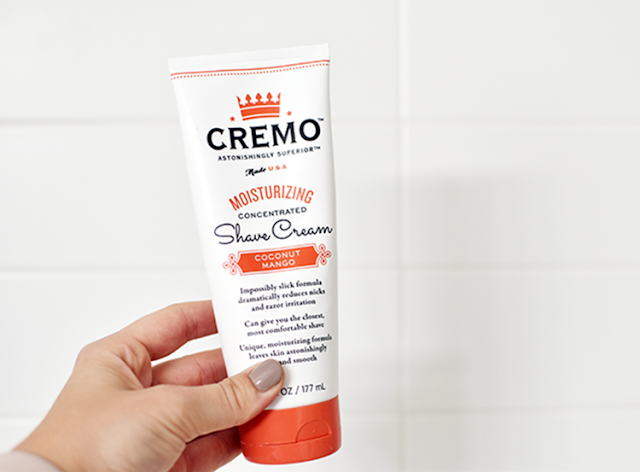 Cremo Shaving Cream / Now that winter is over and my legs make an appearance in shorts and dresses more than when I'm inside my own apartment, I started the search for a good shaving cream that wouldn't irritate my legs and also did not break the bank. I previously was using this shower oil from L'Occitane because it was the only thing I had found that wouldn't leave my skin irritated. But it can get pretty pricey and honestly I really dread going to the mall if I don't have to! I found this shaving cream while I was on a Target run and it smelled so good and had a way different texture than any other drugstore shaving cream I had tried. Fast forward a few months and I honestly don't know where this has been my whole life. I haven't had skin irritation on my legs from shaving since I started using this and it is well worth the $8 price tag! Some of these products are a little on the pricier end of things so I've tried to include budget friendly options as well. I'm super nosy and love to read what products others are using, so I hope you've enjoyed reading about my recent beauty favorites! 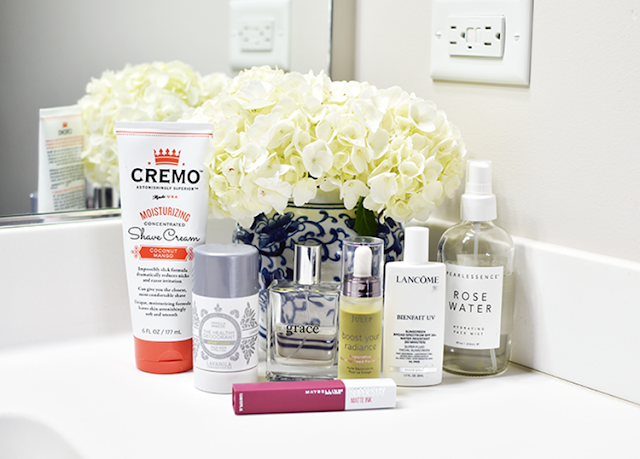 Some of these products (marked with c/o) were sent to me for testing purposes. 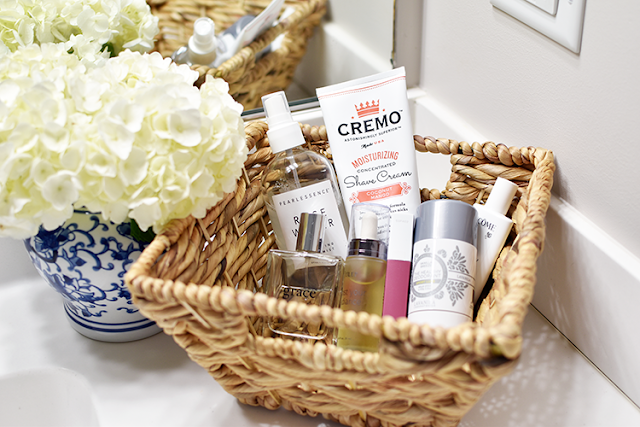 All comments and opinions on these products, and on anything featured on Mrs. on the Move, are always my own and are how I truly feel about the product! Thank you for supporting the brands that support Mrs. on the Move so I can continue to share with you!